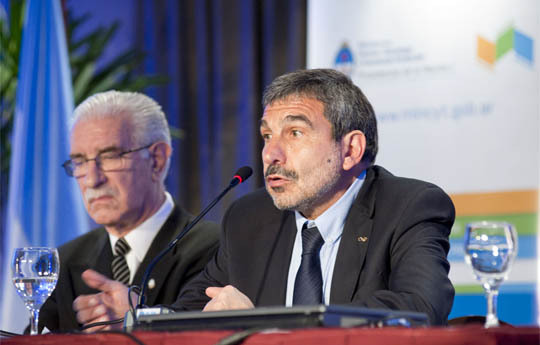 The president of the National Scientific and technical Research Council (CONICET), Roberto Salvarezza, participated in the meeting “Argentina Innovadora 2020 Plan: Implementation and initial results of the 2012-2015 programme” at the Hall of the Americas of the Sheraton Libertador Hotel. The objective of the activity was to analyze an update on the application of the National Plan for Science, Technology and Innovation. “Today we have a strengthened system that aims to foster innovation and development in all sectors that have the possibility of integrating a more diversified and acute productive matrix in knowledge and technology”, stated Ruth Ladenhim, secretary of Planning and Policy of the Ministry of Science, Technology and Productive Innovation. She also added that “the Plan serves as a tool for this objective and this stage of programming allows us to guide the scientific and technological system to specific areas”. CONICET supports the Ministry in this National Plan with active policies and new tools that enable the increment of PhDs and the development of residence programmes, such as the new Centres for Research and Technology Transference with coverage throughout the country. In this regard, Salvarezza highlights the importance of “transferring that knowledge and creating new venues with thematic strategies that allow the government to make questions based on the demands of the country. Thus, the scientific community provides solutions in those matters enhancing the quality of life of the population”. Finally, Salvarezza remarked the creation of a technology-based company like “Y-TEC, generated by YPF and CONICET, in which investigators and fellows develop their work in a national industrial company”, he concluded. The methodology for the design of the Plan was participatory and the debate was carried out together with 300 experts of the scientific, technological, productive and social areas. The results presented during the meeting concerned the conclusions of the first 14 working roundtables held in 2012 and 2013, which included a number of 40 meetings with the participation of 650 specialists.